Born on April 3, 1931, in Charlotte, Alan Dickson and his brother would take the R. S. Dickson & Co. and build a congolmerate, Ruddick Corporation, into one of Fortune Magazine's leading firms. Junior Achievement Founded in 1919 in Gastonia, R. S. Dickson & Company started out investing in textile firms. In early 1929, the company moved to Charlotte and continued its investment banking business. In September 1942, the R. S. Dickson & Company purchased American Yarn & Processing Company. In 1947, the Dickson Company bought Efird Manufacturing Company, and merged the two operations in 1952 as American & Efird Mills, INc.
Alan Dickson grew up in Charlotte. He graduated from North Carolina State in textiles in 1953, and then got his MBA from Harvard in 1955. After two years in the Army, Alan returned to join the textile firm, American & Efird (A&E), as director of quality control (1957-1958), then vice president and director of manufacturing (1959-1962). 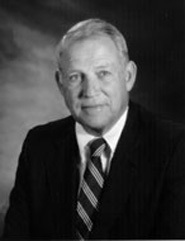 From 1962 to 1966, Alan served as executive vice president and treasurer for American & Efird. He became president (1967-1969) of A&E, which had become one of the leading thread manufacturers. In 1968, Alan and Stuart Dickson took the diversified holdings of R. S. Dickson & Company and created Ruddick Corporation  traded on the New York Stock Exchange. Alan was president of the new corporation until 1994, when he became chairman of the board. Today, Ruddick Corporation has two major companies - Harris Teeter grocery stores and American & Efird - with annual sales of more than $2.6 million. It is one of Fortune Magazine's top U.S. companies. Alan has served on boards of major national corporations, including Bank of America, Bassett Furniture Industries, Sonoco Products and Lance. But Alan has done much more than just his business career. He serves on the boards of numerous schools and colleges, as well as numerous foundations. These organizations included Central Piedmont Community College, Foundation for the Carolinas, Presbyterian Hospital Foundation, North Carolina State University and others. Among the awards presented to Alan are the Watauga Medal (North Carolina State University) and the Spirit Award from the Mint Museum of Art.